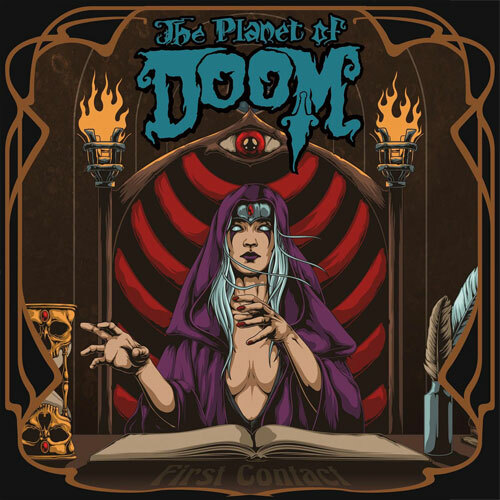 In the spirit of R-rated animated films like “Heavy Metal” and the works of Ralph Bakshi,Riff Lodge Animation (the studio behind the mind-blowing music video for Conan’s “Throne of Fire”) are creating an EPIC feature-length fantasy/science-fiction film titled “The Planet of Doom”, created entirely by both artists and bands within the doom/stoner/psych/metal genres. Set for release in 2020 and subtitled as “An Animated Tale of Metal and Art”, “The Planet of Doom” features a worldwide assembly of 17 respected artists and animators and 18 revered bands and promises to present a colossal compendium of underground culture and this generation’s ode to counterculture. On June 22, Ripple Music will release First Contact: Music From The Original Soundtrack ‘The Planet of Doom’, a teaser EP including four of the film’s featured groups: Mos Generator(USA), Messa (Italy), Vokonis (Sweden) and Slomatics (Ireland).